TDS means 'Tax Deducted at Source'. TDS is one of the modes of collection of taxes, by which a certain percentage of amount is deducted by a person at the time of making / crediting certain specific nature of payment to the other person and deducted amount is remitted to the Government Account. A significant part of Income tax collection comes through TDS ,so Tax machinery is monitoring the TDS collection minutely. In view of above ,Deduction of Tax at correct rate is very important for deductor and minor mistake in deduction leads to penalty in shape of Interest on late deposit and disallowance of Expenses. We have Compiled Tax deduction rates chart (TDS rate chart) for Financial year 2017-18 Assessment year 2018-19 which may be useful for all the readers. You may also download full post along with other details in PDF from the link given at the end of the post. Kindly give suggestion/queries/errors/amendments in comment section or raniraj1950 at gmail.com , suitable prizes will be given to persons who will point out error(s) or sent good suggestions about this post. Not aaplicable on Cent/ State Govt, Embassy-High Comm etc, Local Auth, PSU Transport Company. No TDS on service Tax :As per circular 01/2014 dated 13.01.2014 TDS is not applicable on service tax part if service tax is shown separately. TDS on Good Transport wef 01.06.2015 : TDS shall be applicable on payment to transporter wef 01.06.2015 .However tds exemption will be available only to those transporters who own ten or less goods carriages at any time during the previous year. Such a transporter would also need to furnish a declaration to that effect to the payer along with the PAN. Surcharge on tax other than salary is not deductible/collectible at source in case of resident individual/ HUF /Firm/ AOP / BOI/Domestic Company in respect of payment of income other than salary. TDS is deductible on full amount if threshold limit is crossed during the year including the amount paid earlier during the year along with interest ,if applicable. No Cess on payment made to resident: Education Cess is not deductible/collectible at source in case of resident Individual/HUF/Firm/ AOP/ BOI/ Domestic Company in respect of payment of income other than salary.Education Cess @ 2% plus secondary & Higher Education Cess @ 1% is deductible at source in case of non-residents and foreign company. iii) at the rate of twenty per cent. The deductor has to determine the tax amount in all the three conditions and apply the higher rate of TDS. However, where the income of the employee computed for TDS u/s 192 is below taxable limit, no tax will be deducted. But where the income of the employee computed for TDS u/s 192 is above taxable limit, the deductor will calculate the average rate of income-tax based on rates in force as provided in sec 192. If the tax so calculated is below 20%, deduction of tax will be made at the rate of 20% and in case the average rate exceeds 20%, tax is to deducted at the average rate. Education cess @ 2% and Secondary and Higher Education Cess @ 1% is not to be deducted, in case the tax is deducted at 20% u/s 206AA of the Act. 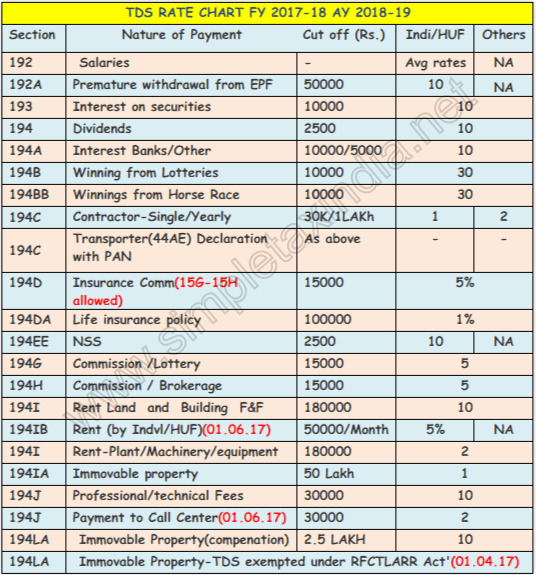 TDS by Individual and HUF (Non Audit) cases not deductible An Individual or a Hindu Undivided Family whose total sales, gross receipts or turnover from business or profession carried on by him does not exceeds the monetary limits (Rs.100,00,000 in case of business & Rs.50,00,000 in case of profession) under Clause (a) or (b) of Sec.44AB during the immediately preceding financial year shall not be liable to deduct tax u/s.194A,194C, 194H, 194I & 194J.So no tax is deductible by HUF/Individual in first year of operations of business even sales/receipt is more than 100/50 Lakh. (iv)every company other than a domestic company at the rate of five per cent. where the income or the aggregate of income paid or likely to be paid and subject to deduction exceeds ten crore rupees. TCS rate chart is given below for your ready reference. Nature of contract or licence or lease, etc. (iii) for any goods, other than those referred to above, or any service, exceeds Rs. 2,00,000. The above category has been abolished wef 01.04.2017 as cash receipt of Rs 2 lakh or more attracts penalty of 100 % so no need to collect TCS on above category. Every person, being a seller, who receives any amount as consideration for sale of a motor vehicle of the value exceeding Rs. 10,00,000, shall, at the time of receipt of such amount, collect from the buyer, a sum equal to 1% of the sale consideration as income-tax. In order to reduce compliance burden in certain cases, it is proposed to amend section 206C, to exempt the following class of buyers such as the Central Government, a State Government, an embassy, a High Commission, legation, commission, consulate and the trade representation of a foreign State; local authority as defined in explanation to clause (20) of Section 10; a public sector company which is engaged in the business of carrying passengers, from the applicability of the provision of subsection (1F) of section 206C of the Act. This amendment will take effect from 1st April, 2017. When Tax is to be deducted/collected ? When tax deducted at source(TDS) is to be deposited (TDS due date of deposit)? When tax is to be deducted ? When date of deduction/Collection is decided then according to point of deduction/collection then due date to deposit is to be decided as under. “Time and mode of payment to Government account of tax deducted at source or tax paid under sub­ section (1A) of section 192. (b) on or before seven days from the end of the month in which the deduction is made or income‐tax is due under sub‐section (1A) of section 192, where tax is paid accompanied by an income‐tax challan. (b) in any other case, on or before seven days from the end of the month in which‐ the deduction is made; or income‐tax is due under sub‐section (1A) of section 192. 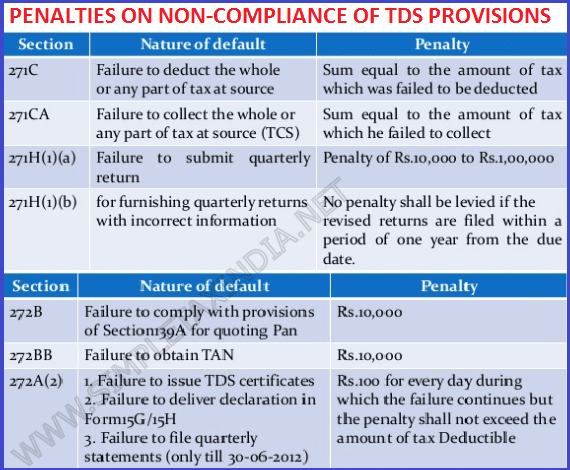 For all sections under TDS and TCS one challan is to be deposited ie ITNS-281 and to deposit TDS/TCS -TAN(tax deduction & collection account number is to be obtained and used. Deductor can adjust excess tds deposited in one section /assessment year with another section /assessment year so no need to deposit section wise challan. TAX must be deposited through online mode only or through designated bank branches. As pointed out above in point number 2 ,you may adjust excess TDS in other section /assessment year/quarter.However if you want refund then you may apply on form 26B online for excess TDS. NOTIFICATION No. 238/2007, dated 30-8-2007.Now following person are liable to file etds/etcs return. The number of deductees’ records in a quarterly statement for any quarter of the immediately preceding financial year is equal to or more than 20. To quote TAN (10 digit reformatted TAN) in all TDS/TCS challans, certificates, statements and other correspondence. To deduct/collect tax at the prescribed rates at the time of every credit or payment, whichever is earlier, in respect of all liable transactions. To remit the tax deducted/collected within the prescribed due dates by using challan no. ITNS 281 by quoting the TAN and relevant section of the Income-tax Act. To issue TDS/TCS certificate, complete in all respects, within the prescribed time in Form No.16(TDS on salaries), 16A(other TDS) 27D( TCS). To file TDS/TCS quarterly statements within the due date and revise the same ,wherever necessary. To mention PAN of all deductees in the TDS/TCS quarterly statements. Download Form 16 / 16A / 16B / 27D. Deductor is required to file TDS/TCS return quarterly , however nil return is not mandatory.This returns may be filed at any TIN-FC by paying a small fee. However you may upload original return directly at efiling site free. As per income tax rules/act Nil tds return is not mandatory , however to facilitate the deductors and to update data Govt has provided a facility on Traces website for declaring NIL tds return. You may file correction return any number of times ,No time limit has been defined yet. This return can be filed with TIN-FC .To file the revised tds return you have to download consolidated FVU file from TDSCPS website The correction return filing facility has not been provided at Income tax India efiling site but we expect that soon it will be made available.However you may correct challan details/tag replace challan/allocation of interest and fees online/move deductee rows from unmatched challan without digital signature at www.tdscpc.gov.in and pan details with digital signature.If short payment of TDS is not settled by deductor then he can not download form 16A/16 of that quarter/year. Justification report : After filing of the return ,Department shall process the return and issue intimation of return processed without default or with defaults. The defaults are mainly on account of deduction of tax at less rate , late filing of return ,interest due to late deposit of Tax ,mismatching overbooking of challan , incorrect pan details etc. In intimation only summary of default is sent to check the details deductor is supposed to download Justification report from TDSCPC website. All above form must be downloaded from TDSCPC (TRACES) website .However in case of Form 16 only PART-A is to be downloaded from TRACES website.Earlier this was mandatory for only companies ,Banks and co-operative societies engaged in Banking services with effect from 01.04.2011 through circular number 3/2011. Form 16A downloaded from TDSCPC can be signed manually or can be authenticated through digital signature only. Tax deducted late :Interest at the rates in force 1% per month from the date on which tax was deductible /collectible to the date of payment to Government Account is chargeable. Tax deducted but not Deposited :The Finance Act 2010 amended interest rate wef 01.07.2010 and created a separate class of default in respect of tax deducted but not paid to levy interest at a higher rate of 1.5 per cent per month, as against 1 per cent p.m.,applicable in case the tax is deducted late after the due date. The rationale behind this amendment is that the tax once deducted belongs to the government and the person withholding the same needs to be penalized by charging higher rate of interest. Interest for full month to be charged for month or part thereof. 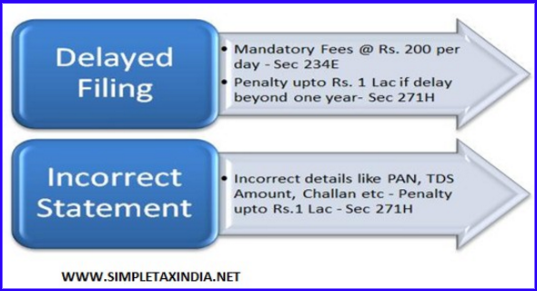 Penalty : equal to the tax that was failed to be deducted/collected or remitted may be leviable. If TDS certificate is not issued within due date as prescribed then penalty @ 200 per day may be imposed till the default continues for each default . However, the maximum penalty cannot exceed the amount of TDS deducted for which TDS certificate was required to be issued. The Deductor will not to be treated as assessee in Default provided the resident payee has furnished his return u/s 139 and has taken into account such amount for computing income in such Return of Income and has paid the Tax Due on the income declared by him in such return of income and furnishes a certificate to this effect, duly certified by a CA, in the prescribed form. This form is yet to be notified. However, the interest for non deduction of tax would be payable from the date on which such tax was collectible till the date of furnishing of return of income by the resident payee. One Challan Can be deposited for all Sections ? TDS on Job work(194C) Tds on Job work has been relaxed read new definition u/s 194C.